Users will be able to own an Apple Watch in nine countries starting April 24, but they'll be able to try out the wrist-worn device in special previews starting at Apple Stores two weeks earlier. Apple Watch will be available on Friday, April 24 in the U.S., U.K., Australia, Canada, China, France, Germany, Hong Kong, and Japan. 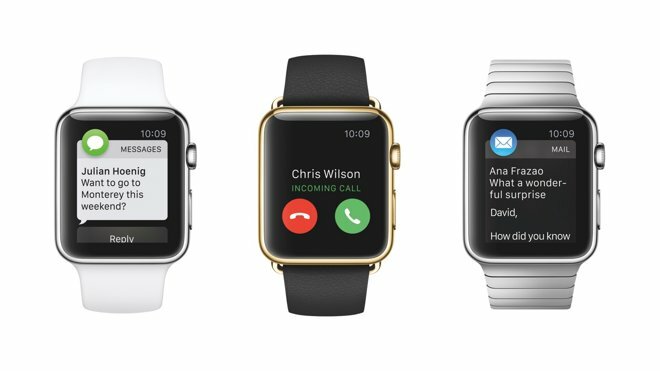 Apple Watch preorders will begin two weeks earlier, on April 10. The device will start at $349 for the 38-millimeter Sport version, while the larger 42-millimeter size will start at $399. The mid-range stainless steel Apple Watch will start at $549 and $599, with higher prices ranging based on band selection. Finally, the high-end Apple Watch Edition will be available in extremely limited quantities, and will carry a $10,000 starting price tag. "Apple Watch begins a new chapter in the way we relate to technology and we think our customers are going to love it," said Tim Cook, Apple's CEO. "We can't wait for people to start wearing Apple Watch to easily access information that matters, to interact with the world, and to live a better day by being more aware of their daily activity than ever before." April 10 will also mark the start of try-ons, by appointment, at Apple's retail stores. The device will also be available to preview at Galeries Lafayette in Paris, Isetan in Tokyo, and Selfridges in London. Those same department store shop-in-shops, as well as other boutiques in major cities across the world, will carry the Apple Watch on its April 24 launch date. Other partners include colette in Paris, Dover Street Market in London and Tokyo, Maxfield in Los Angeles, and The Corner in Berlin.